Yogurt may have been known by the ancient Greeks as pyriate. Andrew Dalby...argues that the Greek physician Galen (c. 130-c. 200) was correct to identify this older term, pyriate, with the oxygala familiar in his own day, which was a form of yogurt and was eaten on its own or with honey. The first unequivocable description of yogurt is found in a dictionary called Divanu luga-i turk, compiled by Kasgarli Mahmut in 1072-1073 during the Seljuk era in the Middle East (1038-1194). Yogurt spread rapidly throughout the Levant, but it hardly penetrated the Western and northern Mediterranean. A Mediterranean Feast, Clifford A. Wright (William Morrow:New York, 1999 (p. 184-5). Yoghurt was known in France as early 1542, when Francois I was suffering from what would now be diagnosed as severe depression. The doctors could do nothing for his listessness and neurasthenia until the Ambassador to the Sublime Porte disclosed that there was a Jewish doctor in Constantinople who made a brew of fermented sheep's milk of which people spoke in glowing terms, even at the Sultan's court. The King sent for the doctor, who refused to travel except on foot; he walted through the whole of southern Europe, followed by his flock. When he finally arrived before Francois I, the latter's apathy had given way to a certain impatience but he still did not feel well. After several weeks of sheep's milk youghurt, the King was cured. The sheep, however, had not recovered from their long walk and caught cold in the air of Paris. Every last one of them died, and the doctor left again, refusing to stay despite the King's offers. He went home, taking the secret of his brew with him. The health of Francois I continued to improve, which was the point of the exercise, and yoghurt was forgotten for nearly four centuries...The koumis of Central Europe is made from fermented mare's milk, but its origin lies in farthest Asia. The barbarian' Huns and Mongols brought it with them. In the past Western Europe made milk based drinks which were not yoghurt, but were more like kefir or diluted and flavoured curds. Such drinks bear withness to the memory of ancient migrations: they are the beverages of people who did not grow vines and whos only wealth was the flocks they drove ahead of them. Yogurt... first gained international prominence in the early 1900s when Ilya Metchnikov, a Russian bacteriologist, observed that the life span of Bulgarians, whose diet included the consumption of large quantities of soured milk, was eighty-seven years and beyond. Craig Claiborne's The New York Times Food Encyclopedia, Joan Whitman compiler (Times Books:New York,1985) (p. 489). Turkish immigrants are said to have brought yogurt to the United states in 1784, but its popularity dates only from the 1940s, when Daniel Carasso emigrated to the United States and took over a small yogurt factory in the Bronx, New York. He was soon joined by Juan Metzger, and the two sold their yogurt under the name Dannon (originally Danone, after Daniel Carcasso whose father was a Barcelona yogurt maker). In 1947 the company added strawberry fruit preserves to make the first sundae style yogurt. When nutrition promoter Benjamin Gayelord Hauser published an excerpt from his book Live Younger, Live Longer, 1950, in the October 1950 issue of Reader's Digest magazine extolling the health virtues of yogurt, the product's sales soared. They leaped again 500 percent from 1958, 1968 when so called health foods were popularized by the counterculture of the 1960s. Encyclopedia of American Food and Drink, John F. Mariani (Lebhar-Friedman:New York, 1999 (p. 355) . Blend together strawberries, bananas, yogurt and vanilla. Pour into pie shells and place in freezer for 4 hours. Remove from freezer 15 minutes before serving. Enjoy! Note... if you have leftovers, wrap in cling wrap and place in freezer. ooh looks like the perfect summertime dessert! This pie is perfect for the hot weather we've been having. I love how easy this dessert is! It sounds delicious...healthy too. Yum! Interesting story. It took me 3 months of living in Paris to finally master the Yohgurt pronouciation. What an awesome idea and love the flavour you've created. Thanks so much for sharing it. Interesting post, Christine! There are so many different flavours of yoghurt nowadays and I always feel good having some yoghurt due to its health benefit. Summer in a pie, fantastic! Great combo, I just love this. And no bake in this heat is a great idea. Mmmmm....wonderful cool pie for the dog days of summer!! Looks delish, Christine! This sounds like my kind of pie! Perfect for summer. This sounds like the perfect summertime pie. I'm going to give it a try this weekend! What a great no-bake dessert combining some of my favorite flavors! Can't wait to try this one. What a cool and unique idea! Sounds like the perfect dessert for a hot summer night! Hi Outlaw, the pie was very refreshing and taste great... yum! If you try the pie let me know what you think. Hi Eating Deliciously, perfect pie for the summer. If you try the pie let me what you think. It's such a cool quick dessert to make in a summer. I make a mini one, similar to this, with varied fruits for my daughter on demand :) great info on yogurt! What an interesting idea. It seems perfectly logical - 1) I love smoothies, 2) I love pie, 3) I will love this smoothie pie. YUMMY!!!! I would never think to make something like this, great light summer dessert. Totally making this one! Mmm, smoothie in a pie form! Excellent idea! This recipe is simply genius! 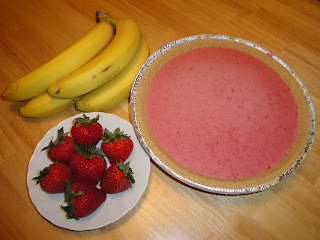 I love strawberry banana smoothies and the idea of eating it in the form of a frozen pie sounds heavenly. Buzz Buzz! This recipe sounds delicious and healthy! Perfect for summer. Instead of my usual smoothie...next time I will turn it into a pie. Great tip, Christine! What a fantastic and healthy pie! Great idea! I love smoothies and pie so this is perfect! Hey everyone, thank you so much for all your kind comments. I read them all and they make me happy. Will be a great smoothie for the killer and hot weather we are going through at Malaysia. That looks great and super tasty - what a great idea! What a great idea for hot days, fruit smoothie pie, and no oven involved!